Hawley’s bill, the Supporting and Treating Officers In Crisis Act of 2019, is co-authored by Sen. Sheldon Whitehouse (D., R.I.). It has already garnered support from a bipartisan cadre ranging from Sen. Tom Cotton (R., Ark.) to Sen. Mazie Hirono (D., Hawaii). If enacted, the STOIC Act would expand the statutory language of pre-existing family-support grant programs to ensure that they supported suicide-prevention efforts, mental-health screenings, and training to identify officers at risk for suicide. It would also appropriate $7.5 million annually for the next five years to these programs, which have gone without funding since 2000. Stress, trauma, and suicide are majors issues among law enforcement. According to Hawley’s office, law-enforcement officers report above-average levels of stress, indicating stressors ranging from dealing with family disputes (83 percent of officers) to being compelled to use force (59 percent) to being physically attacked while on duty (23 percent). These stressors can have lasting physical and mental tolls. Between 25 percent and 30 percent of officers have physical-health problems, like heart disease and gastrointestinal illnesses, related to their job stress. Seven percent of officers in one study were found to meet the criteria for Post-Traumatic Stress Disorder. Sometimes, these heavy burdens lead to tragedy. The number of officers who have committed suicide has risen for the past three years, up to 160 in 2018. By comparison 144 officers died in the line of duty last year, meaning that an officer is more likely to take his own life than to lose it doing his job. The CDC found that the suicide rate among law-enforcement officers and firefighters is 40 percent higher than the national average. 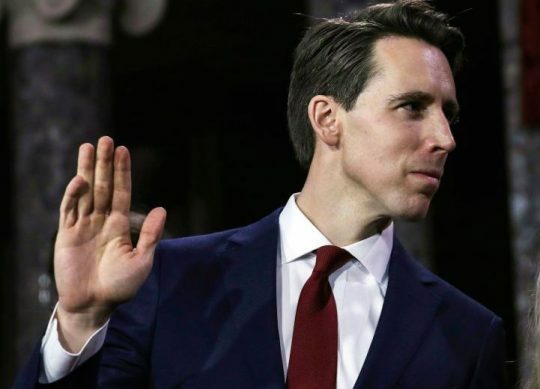 "Every day law enforcement demonstrates tremendous bravery in protecting us from the worst of humanity, but it often takes a toll," Hawley said. "Police work is physically, mentally, and emotionally demanding. This legislation will provide much-needed support to the heroes that keep us safe." This entry was posted in Issues and tagged Josh Hawley, Mazie Hirono, Sheldon Whitehouse, Tom Cotton. Bookmark the permalink.